NETWORK FINALS: After adjustment for the NFL overrun, THE SIMPSONS fell 0.6 in final numbers, and BOB’S BURGERS, FAMILY GUY and REL were all down 0.1. CABLE HIGHLIGHTS: Bravo’s DIRTY JOHN had an impressive finale, up 0.16 to 0.59 (see its unscripted lead-ins below), with the lead-out special on sister network Oxygen at 0.15. HBO’s TRUE DETECTIVE returned with a 1st hour at a solid 0.48, but Hour 2 fell to 0.33 (neither compared to the Season 2 premiere in 2015 at 1.42). Adult Swim’s TIGTONE was at 0.31/0.28. Showtime’s season finale of RAY DONOVAN was at 0.22, up 0.04 from last week and down 0.04 from last season’s finale. Starz’s OUTLANDER gained 0.02 to 0.21. NatGeo’s VALLEY OF THE BOOM premiered at 0.13/0.10. 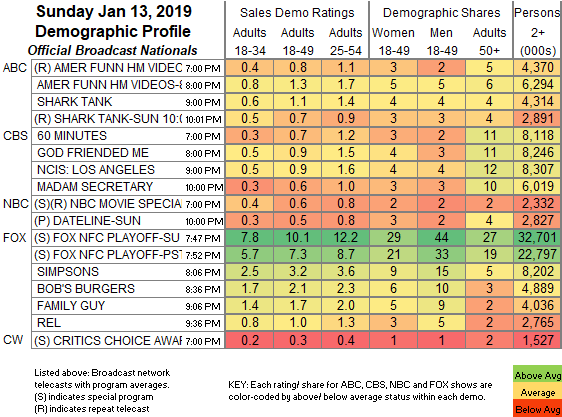 TLC’s 90 DAY FIANCE led unscripted, up a tick to 0.91, with RETURN TO AMISH steady at 0.31. On Bravo, REAL HOUSEWIVES OF ATLANTA rose 0.04 to 0.87, and MARRIED TO MEDICINE was up 0.08 to 0.61. Food Network’s WORST COOKS IN AMERICA climbed 0.09 to 0.58. NBC Sports Net’s PREMIER LEAGUE match was at 0.39. 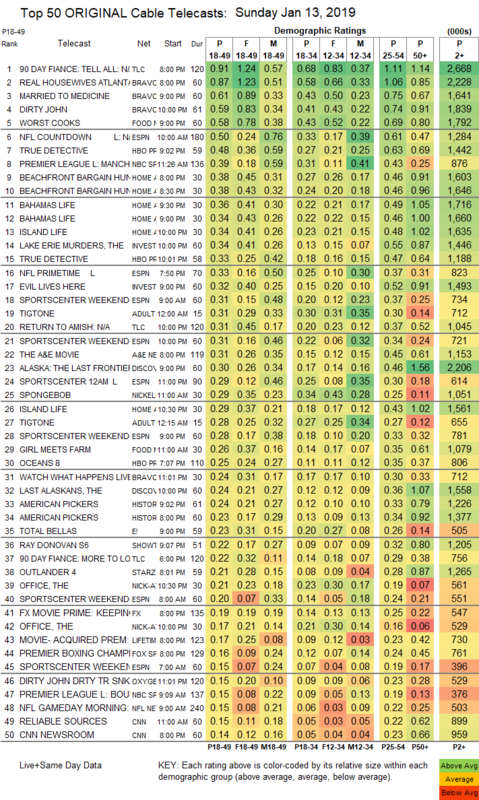 HGTV’s line-up was led by BEACHFRONT BARGAIN HUNT at 0.38/0.38, compared to last week’s 0.26/0.25. On ID, THE LAKE ERIE MURDERS dropped 0.04 to 0.34, and EVIL LIVES HERE fell 0.14 to 0.32. On Discovery, ALASKA: THE LAST FRONTIER ticked down to 0.30, and THE LAST ALASKANS ticked up to 0.24. E!’s TOTAL BELLAS returned at 0.23.